Salt licks have long been used to ensure that horses and other animals receive all the minerals required for optimal health. Like humans, horses lose body salts through sweat during exercise. This makes salt supplementation even more vital throughout the hot summer months. Even during restful days, your horse will require around 10 grams of sodium a day. Sodium is one of the main electrolytes found in the blood and in the fluid surrounding cells. When sodium levels become low the adrenal glands release the hormone aldosterone, which instructs the kidneys to retain sodium and excrete potassium in its place, thus creating an imbalance. What Makes Himalayan Rock Salt Special? Pure refined sodium chloride (NaCl; regular table salts and most sea-salts) contain no additional beneficial compounds except for Iodine which is actually added after the refining process as a method of preventing certain disorders, eg. goitre. In contrast, Himalayan rock salt is packed full of essential minerals and trace minerals (60+) that help your horse to stay in tip top condition. Regular sodium blocks are compressed making them easily breakable by a strong pair of teeth. They're also much more likely to go mushy after a few days in a rainy paddock. 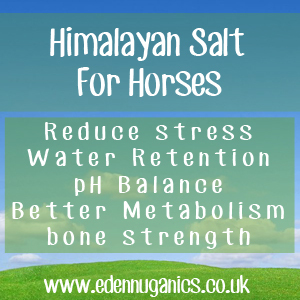 Himalayan rock salt is really tough, meaning you can keep it outside all year round without the chance of your horse eating more than it should. If your horses hang out with other animals like goats or donkeys, that's no problem, they will enjoy the salt lick as well and receive the same benefits. The minerals found in Himalayan salt help to reduce the kidney's workload by reducing water retention. How to Use Himalayan Salt? There are two main ways to include this ancient mineral in your horse's diet. The first and most popular is as a simple salt lick. It is now possible to buy Himalayan salt ready threaded with a rope to be hung all year round inside or outdoors. In the winter months horses tend to avoid the often freezing cold salt licks. During these months crushed salt can be added directly to feed to aid in mineral supplementation. Around 10 grams a day per horse should be sufficient, although more can be added during periods of increased exercise. If a horse has been starved of salt or had a reduced intake for a prolonged period of time, it is best to control the amount of salt it gets until its craving for salt stabilises, too much salt can leave your horse with an upset stomach along with other health issues.